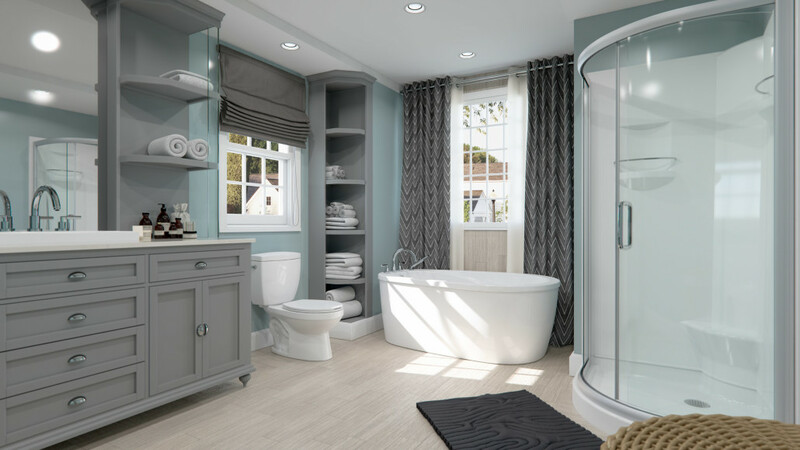 Does your bathroom require renovation, and the time, effort and extra finance for repairs is not enough? There are several quick and affordable ways to breathe new life into her interior. Any surface is peculiar to accumulate dirt. General cleaning with household chemicals and thorough polishing with a soapy sponge requires patience, but they have a tangible effect: after a few hours the surfaces will shine with cleanliness and freshness. Scales, cracks and scratches on faience and ceramics perfectly align transparent or colored mastics and putties on a polymer base. What if the enamel coating of the bath has faded and in some places started to peel off? Several layers of the mixture will return the former snow-white bath in just a few hours. The color of pipes and other painted surfaces should also be refreshed from time to time. Use moisture-resistant acrylic paint. It dries quickly and has no smell. Aerosol painting from cans of individual interior elements is another budget way to diversify the interior of the bathroom. Simply cover the glossy gilded outer part of the bath (do not forget to glue all unused surfaces with paint tape), heated towel rails, hot and cold water distribution or a toilet bowl. Old tiles can be renewed without major repairs. If the tile is monophonic, and its surface is uniform, using a stencil template or a sticker from the film, you can decorate it with original patterns. Also, with the help of a special primer for tiles, you can paint its surface in monophonic color, paint in a checkerboard pattern or create geometric abstractions (paint the walls in a rainbow equalizer!). What if there are cracks on the tile? Replace with a new similar or decorative! To do this, use a spatula to clean the joints around the perimeter of the damaged tile, and then carefully remove it using a chisel and a hammer. Clean the surfaces of the remnants of the solution apply a layer of tile glue with a combed spatula and glue the decorative slice. In order for the seams to be equally smooth, use plastic crosses. Over time, the interlining seams have a tendency to darken and become covered with a touch of dirt. To return to them the former cleanliness and attractiveness will help mechanical cleaning or coating with a new layer of trowel putty. If you want to replace the joints thoroughly, with a spatula or flat screwdriver, gently clean the old grout so that the edges of the tile are not damaged, then wipe the slots with a damp sponge and apply a fresh mixture. 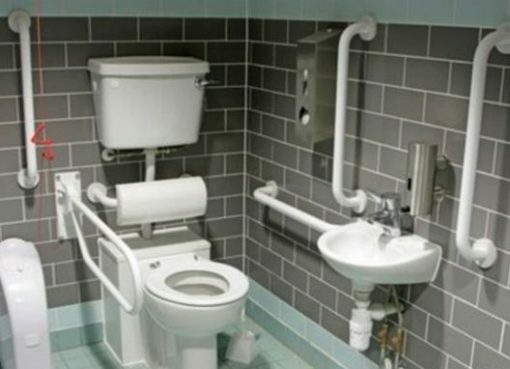 By the same principle, you can re-seal the sanitary silicone seams between the wall, bathroom and washbasin. 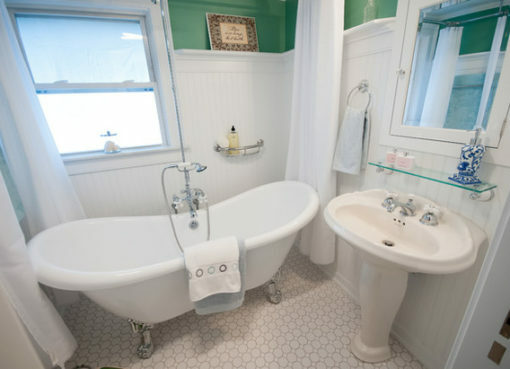 If you are bored with the uniformity of your bathroom, dilute it with bright contrast accents. For this, it is not necessary to change the tile to a new one. You can achieve the desired effect due to bright accessories. The Internet offers special tables for the selection of related and contrasting shades. Following expert recommendations combine some bright colors and create a real holiday of color in your bathroom. Another decoration of the bathroom is a low decorative masonry made of glass blocks. The decor of this material, gaining increasing popularity, will look bright and original. Lighting in the bathroom plays a big role. The room will appear literally in a new light, if you replace conventional bulbs with energy-saving ones (the market offers a large choice of sizes and shapes: from spiral to stylized candles), and the old plafond – new, more modern and original (for example, from colored glass). 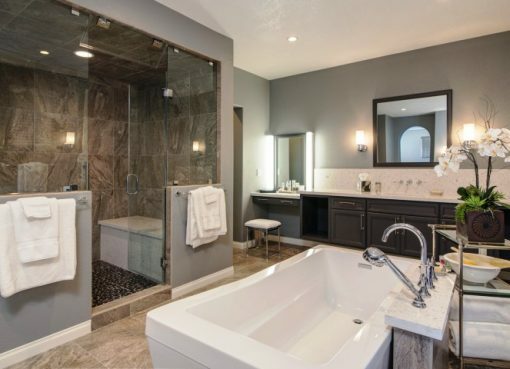 If the bathroom is not large, the panoramic mirror will help to increase it visually. As an option – fix the small mirror plates on the ceiling. The chrome surface in close friendship with the mirror and the lamp reflects the light. More chrome – more glare. In addition to the chrome-plated mixer, there can be: a plug on the sink, a door handle, a new heated towel rail, hooks, shelves. Add a highlight in the interior of the bathroom will help items made by yourself, and unique accessories in the style of the avant-garde. This can be holders for towels in the form of an ornate vine, a non-trivial soap dish in the form of an open palm, a mirror in the frame with pearlescent stucco molding or a mosaic panel on a free theme (which, incidentally, can be made from splinters of tiles and old utensils). In tandem with a floor mat imitating green grass will give the bathroom freshness and create an atmosphere of summer carelessness. But the starfish, shells and corals all year round will inspire a holiday mood and pleasant memories. You can also place hanging shelves along one of the walls for pleasant and pleasing to the eye little things: colorful handmade soaps, aromatic candles and sea stones. Restyling or renovating a bathroom with a small budget is therefore quite simple. This can be done by replacing a number of parts of the bathroom, by painting or by applying a few beautiful unique accessories.